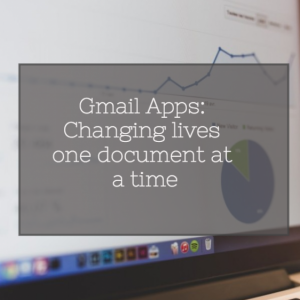 Change the way you save documents and make the switch to Gmail apps today! Did not save the file. Named the document something that is hard to find. Saved it in a different folder and is now lost. If you are like me, I save all of my documents on either my desktop or in special folders. Even if they are saved in a folder it is the biggest hassle to search for the document I want. When I am ready to send an attachment I am usually left panicking about one or all of the scenarios listed above. My previous concerns were immediately put to rest when I found out about the magic of Gmail Apps. I’ve been an avid Gmail user for some time now but never utilized everything the Gmail Apps suite has to offer until recently. After my manager shared with me the power of Gmail apps through my account, I was immediately hooked. Now, I don’t have to save every draft and every eBook on my laptop and clutter my desktop. I can save them through Google Drive and share them with my supervisors for edits and final approval. Here are three of my favorite Gmail Apps and how they have changed the way I share documents and even how they can change yours too! The. Best. Thing. Ever. During my undergrad, I was a journalism major and worked for the school newspaper. Each week, I had to submit 2 stories and send them through an e-mail. This meant I had to write each article through a word document, save it to my desktop and then send it through an e-mail attachment. Needless to say, around the 5th week of school my desktop was cluttered and it was extremely hard to find a document when I went to send an attachment. The magic of Google Docs, Slides and Sheets is truly astounding. With Google Docs, I can begin to write a blog and have it automatically save without having to save a separate document and have it clutter my desktop. Google Docs is very similar to Microsoft word but with Docs, I can also automatically share my progress with both of my supervisors so they are able to see my draft and their edits will also show up on the side whenever they modify the document. I also am in love with Google Sheets. Google Sheets is basically Microsoft Excel except you are able to collaborate with others, by allowing them editing capabilities and comments all on the spreadsheet. For example, I am in an organization and we have used Google Sheets as sign-ups for various events. It’s simple because the Google account user can make the document and share it to members of the organization. Once they have accepted access they are invited to edit it and sign-up for whatever they would like. This has been one of the most useful Gmail apps, especially in organizations. Besides Docs and sheets, I have also found Google Calendar to be very useful. Google Calendar is another one of my favorite Gmail Apps. In the past, I have sent coworkers and friends week at a glances I have made through Microsoft Excel. This also involved saving the document and searching for it once I wanted to send it as an attachment. With Google Calendar, it is so simple to share your Day and Week at a Glance with other Google Account users. All you do is enter times you are free, busy, in a meeting, or out of the office and other Google Account users that are linked to your calendar will be able to have access to it. This also eliminates coworkers asking where you are and when you are in the office. Here on our team at VING, we are all Google calendar junkies. If I ever have a question for my supervisor, I can easily check her availability on Google Calendar and I will know if she is free to chat! Utilizing Google Calendars has also really helped me see when I have free time during the day as well. I use it for things outside of work and it is a life saver! Along with Google Calendar, I find the Google Hangouts feature of one of the most innovative maps Gmail Apps has to offer. Google Hangouts is probably one of the coolest Google Apps I’ve used. In Google Hangouts, you are able to instant message with up to 100 people and even video chat with up to 10 people. You can even personalize the backgrounds of chat messages with certain people! At Ving, we use Google Hangouts to communicate with each other via instant message since a lot of us are not all in the office at the same time because of location and scheduling issues. It’s really convenient because we are all usually on our e-mail account at all times anyways and it’s nice to be able to get that instant answer to a question one of us might have. For example, the COO of our company is based out of Georgia and if I have a question, I am able to get ahold of her very easily through Google Hangouts. Looking for another way to change up the way you communicate with your office? Try Ving today and add a new innovative way to clear up communication issues!